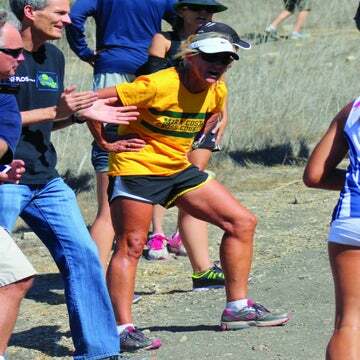 Read about our latest Running Inspiration Award winner, Nicole Gross - a triathlon coach and Boston Marathon survivor! As Nicole Gross, 31, waited near the finish line of the 2013 Boston Marathon, she felt happy and strong. A triathlon coach and personal trainer, she was proud to have prepared her mother for the race and thrilled to be cheering alongside her sister, Erika. Gross herself was in the best shape of her life, thanks to training for a fitness competition in Charlotte, N.C., where she lives with her husband. Then came the bombs—and everything changed. Gross remembers being blown backward by the force of the explosion. Then laying on the ground terrified another would come. A photo taken of Gross in this moment— her shirt tattered, her blond hair disheveled, her face a mask of shock—would become one of the defining images of the tragedy. Gross was hospitalized for 33 days in Boston, recovering from two breaks in her left leg, a nearly severed right Achilles tendon and hearing damage. Her sister lost her left leg above the knee. A swimmer in college, Gross had spent much of her adult life competing in triathlons, where she routinely netted age-group awards. When the athlete had to relearn how to walk during her recovery and rehabilitation, she applied the mental toughness acquired through years of hard training. And in supporting her sister, she fell into another familiar role: coach. Now back in Charlotte, Gross continues to focus on rehabilitation. But she’s also starting to look forward to new goals with an incredibly positive outlook. She’s doing the same in her role of coach, both for her sister and her mom, who recently received an invitation to the 2014 Boston Marathon. Donate to the Be Strong Stay Strong Fund, which benefits Nicole and Erika’s recovery. Visit bestrongstaystrong.net to learn more.